Cyclists Pay For Our Roads, Too! One argument that seems to pop up with the anti-bike crowd is that cyclists don’t pay their fair share of the costs associated with road maintenance and construction. 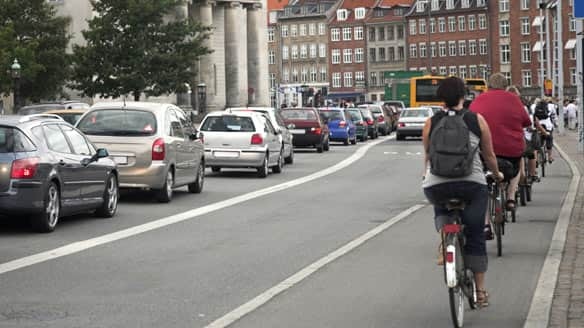 While intuition should tell you that the costs of cyclists on our roadways is minimal, due to the small amount of wear that bicycles cause on our roads, many use it as an excuse for not supporting projects for bicycle related infrastructure (bikeways, signs, trails, lanes, etc). As it turns out, cyclists not only pay their fair share: they often subsidize cars. Trier, like a lot of misinformed folks, seems to believe the only road taxes we pay are motor vehicle licensing fees and fuel taxes. But the truth is that those fees largely pay for state and federal highways, and even then only a portion of them. The rest of the costs of those roadways are borne by all taxpayers generally, including bicyclists, through local, property and sales taxes. Local roads, where you find most cyclists, are another story altogether. Indeed, most bicyclists in fact also own cars, so they’re also paying the licensing fees and gas taxes as well. But by using their bikes in place of cars, the wear and tear (and subsequent maintenance costs) they inflict is exponentially less than that caused by cars and trucks. A 1995 study titled “Whose Roads?” by cycling advocate Todd Litman laid all this out in detail. The study estimated that automobile users pay an average of 2.3 cents per mile in user fees, including fuel taxes and vehicle registration fees, while they actually impose 6.5 cents per mile in road service costs. Who pays the difference? It’s picked up by general taxes and property assessments. So while bicyclists pay an equal share of those taxes, they impose costs averaging only 0.2 cents per mile in road service costs. The amount bicyclists overpay leaps out when you look at the costs of local roads, the roads cyclists use most. Litman found that only a third of the funds for their construction and maintenance comes from vehicle user charges; local property, income and sales taxes pay the rest. Automobile user fees contribute only about 1 cent per mile toward the costs of local roads but simultaneously impose costs more than six times that amount. Beyond that, cyclists reduce pollution, reduce traffic congestion, and lower healthcare costs by living healthier lifestyles. So, we should all feel entitled to safer streets that make room for us. We’re paying for it! You can read the full column by David Neiwert here. Here is a PDF of the traffic study this is taken from. What are you wearing in winter? 1. SKS Commuter Bicycle Fender Set: I should have gotten these a while ago as it would have kept my bike a lot cleaner, but in the coming winter months I am really going to need them as rain is nothing compared to snow when it comes to dirtying your bike. 2. Outdoor Research Ninjaclava Balaclava: I need a balaclava for a few reasons. The foremost of which is to keep my face warm on those cold winter days. The nerd in me says, “Hey, as long as you are getting a mask for your face why not look like a ninja?” So here’s my question, should I wear goggles with this or is it not meant for goggles? 3. Full Face Mask-Orange Flame W11S23D: I was torn between getting a balaclava and a face mask for a while when it finally dawned on me, “Why not get both?” So here it is. The problem with the face masks and the half masks is that a lot of them are all really scary. I think my goal here is not to look like a maniac, but to keep my face warm and rain free. Does anyone have any suggestions on masks? 4. Half face Mask – Spider Web W11S25D: I don’t know if I’d like the full or half mask better so I came to the same conclusion as before, get both! I was always a fan of Spider-Man so this just made sense. There are two items I haven’t decided on mostly because I haven’t researched them yet. These are goggles and full fingered gloves. If anyone has any suggestions I would be glad to hear them in the comments. Tagged as construction, Fuller Rd. What is the best alternate transportation for you?